High cholesterol is a common condition that can be managed by small lifestyle changes and Dr. Gopika Gangupantula’s instructions. It affects people whether they have diabetes or not, and can even be hereditary. 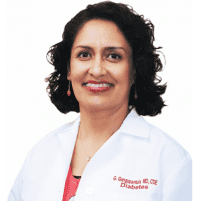 If you want to manage your cholesterol and achieve your healthiest condition, visit Valley Diabetes & Obesity in Modesto, California to apply Dr. Gangupantula’s plan for you. Cholesterol is a type of fat (lipid) that lives in your blood, derived from the food you eat. Your cells need cholesterol, but often various causes can lead to its buildup in your arteries. Having high cholesterol can produce severe consequences as it inhibits your blood flow. Why do cholesterol levels matter? Dr. Gangupantula can best assess your cholesterol levels to identify any risks for a heart attack or stroke. As every individual differs in bodily processes, visiting Dr. Gangupantula can clarify any concerns you may have about your habits. What are symptoms of having high cholesterol? High cholesterol does not produce symptoms. You should have regular blood tests performed to measure your cholesterol levels. What effect does having high cholesterol produce? Early detection and health care can improve your well-being before you reach atherosclerosis. What are risk factors for high cholesterol levels?